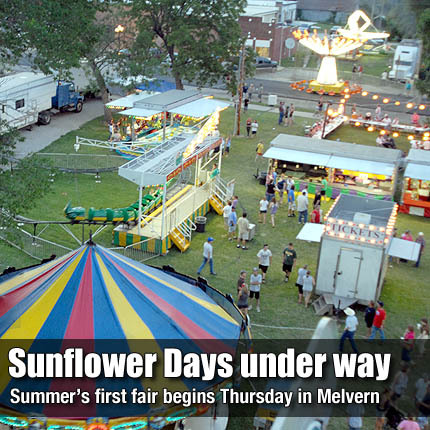 The county’s first fair this summer got underway today at Melvern during the annual celebration of Sunflower Days, offering three days of 4-H activities and other events, including a baby show, homemade ice cream, a movie and a carnival. Thursday, 4-H and FFA entries are to be entered 10:30 a.m. to 12:30 p.m. at the Melvern Community Center. Activities continue with FCS judging at 1 p.m., goat and sheep show at 6 p.m., baby show at 6:30 p.m., homemade ice cream in the park at 7 p.m., and movie night at 8 p.m. at the Melvern Community Center. At 9 a.m. Friday, 4-H hand pets, fowl and rabbits will be shown in the north sheep barn. At 5 p.m. the dairy cattle show begins, followed by bucket calves, beef cattle and swine. Friday’s activities include a barbecue cookoff in the park, homemade ice cream and entertainment at the bandstand at 7 p.m. Live entertainment begins at 9 p.m. at Legends. Fair activities are all day Saturday, beginning with a pancake feed in the community center at 7 p.m. and children’s races at 9 a.m. at the Melvern school. All exhibits will be released at noon. Marais des Cygnes Valley and Melvern alumni luncheon begins at noon at the Melvern Community Center. Old-fashioned games and turtle races begin with registration at 12:30 p.m.
Saturday’s parade lines up at 6:15 p.m. at Melvern school. The parade begins at 7 p.m. This year’s theme is favorite movie or television show. Homemade ice cream will be served at 8 p.m. at the city park shelter house. A variety show begins at 8:30 p.m. at the bandstand. Live entertainment at Legends will begin at 9 p.m., followed by Kramer’s fireworks show at 10 p.m.
Bingo, hosted by the American Legion and Auxiliary, and amusement rides by Lewellen Rides, will be available all three nights. Overbrook has three days of fun filled events to help celebrate the July 4 holiday. The events start July 3 with a picnic and fireworks display at Grace Community Church. On July 4, children should decorate bikes, trikes, wagons and pedal or electric cars for the parade. No gas powered, motorized vehicles will be allowed. Everyone should meet at the old middle school parking lot under the water tower at 10:20 a.m. The parade route will travel west on Market Street, to Maple Street, north on Maple Street, then east on Santa Fe Trail into the park by the ball diamonds. After the parade, join everyone for a light hotdog lunch at the shelter house by the lake. Bring a plate of cookies to share. Then visit the city pool for a free swim 1-5 p.m. Events are sponsored by Overbrook PRIDE. The fun continues at 6 p.m. July 7 with another evening of fireworks. Activities at the park include food prepared by Cliff O’Bryhim and sold for the benefit of the Veterans memorial fund. Come early and bring a lawn chair to the park pavilion and enjoy music, food and fun concessions. Stay for the fireworks over the city lake at dark. No alcoholic beverages are allowed in the park. Handicap parking will be at the tennis courts. All other parking will be at the ball diamonds or old middle school parking lot. Rain date will be July 8. Events are sponsored by the city of Overbrook. The Osage City Osage County Fair will be July 5-7 at the Osage City fairgrounds. In addition to livestock and other exhibits, the fair will feature a parade, fireworks and a carnival. The fair will get underway with all entries to be checked in 8-11 a.m. July 5 with judging starting at 1 p.m. Beef and bucket calves will be judged at 3 p.m. and sheep show at 7:30 p.m. The Chamber of Commerce pie contest will be at 5 p.m., followed by the parade at 6:30 p.m. Thursday in downtown Osage City. The theme is “I am dreaming of Disney.” The sheep show and Farm Bureau candidates forum follows the parade at 7:30 p.m. and a music program with the band, Sierro, ends the evening. Activities begin July 6 at 8 a.m. with the rabbit and poultry show, followed by the swine show at 9 a.m., goat show at 1 p.m., cat and pet show at 6 p.m. and round robin showmanship championship 7:30 p.m. at the pavilion. The cowboy Olympics starts at 3 p.m. The pedal pull registration starts at 6:30 p.m. followed by the pedal pull at 7 p.m. The annual talent show will be at 7:30 p.m. with a fireworks show beginning around 10:15 p.m.
At 7 p.m., rides start on the midway with wristbands until 11 p.m. Discounted wristbands can be purchased at businesses throughout Osage City, Lyndon and Burlingame until noon July 6, or by calling (785) 528-4352 or (785) 528-4665. The annual dog show begins at 8 a.m. Saturday, followed by the livestock judging contest at 9 a.m. at the pavilion. At noon, all livestock and exhibits will be released from the fairgrounds except sale animals. Carnival rides will be available 1-5 p.m. with wristbands. The 4-H livestock auction will be at 6 p.m., with a demolition derby at 7 p.m.
Each day of the fair, the fairgrounds will close 30 minutes following the last activity of the day. Lyndon will once again host its annual July 4 celebration. The day begins at 7 a.m. with a pancake feed at Lyndon Community Center and a horseshoe tournament at 7:30 a.m. At 10:30 a.m. Topeka Ave. will be the place to be for the July 4 non-motorized parade. The picnic in the city park begins at 11 a.m. Visitors may buy or bring a lunch. Free Frisbees, children’s games and watermelon will be some of the family fun at the park. The city pool will be open 1-6 p.m. free to the public. The saddle club area opens at 6 p.m. Live music and giveaways start at 7 p.m. The day ends with the fireworks display at 9 p.m.